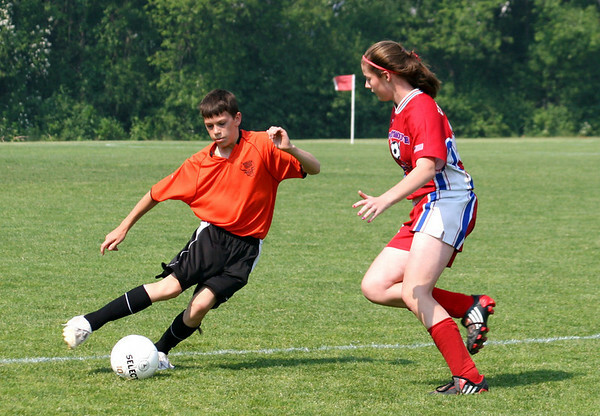 Evan Herlihy, left, kicks the ball away from Molly Wyatt during the match between Woburn Youth Soccer and the Portsmouth, R.I. Pirates. Photo by Mary Catherine Adams/Salem News. , Evan Herlihy, left, kicks the ball away from Molly Wyatt during the match between Woburn Youth Soccer and the Portsmouth, R.I. Pirates. Photo by Mary Catherine Adams/Salem News.